AT&T is sold out of the One X on its website. Thankfully, the phone launched early enough that several third-party retailers, such as Amazon and Target, still have stock. Sprint just launched its EVO 4G LTE flagship phone, but it's impossible to find that device. 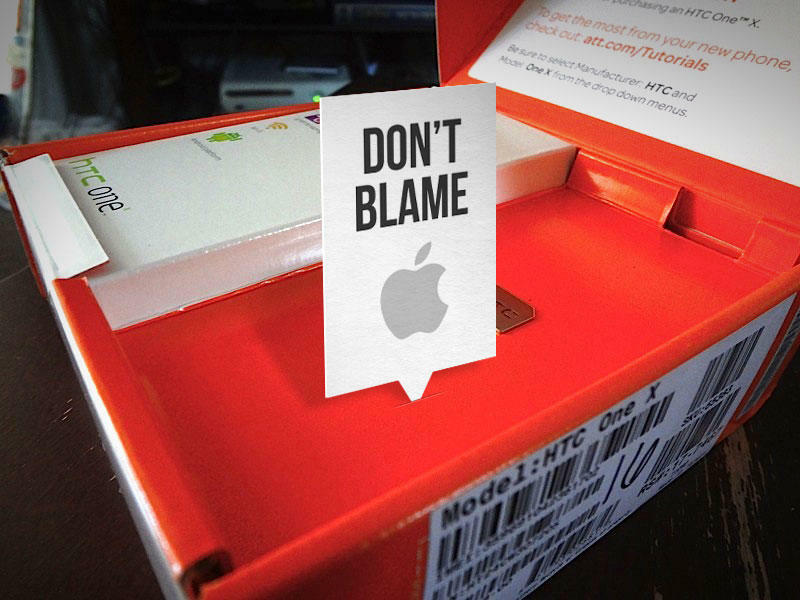 You might want to blame Apple or HTC for the delay, but you shouldn't. We spoke with one expert to shed light on the whole situation. The phones are locked down in U.S. Customs and Border Protection (CBP) due to an ITC exclusion order, which was issued on April 19th after a judge ruled that HTC was infringing on Apple's technology. The tech was specifically related to HTC's custom messaging app and Android's own browser and messaging applications. HTC's software originally allowed users to click a phone number to see a menu of choices asking the user what he or she wanted to do with the number, but that was Apple's technology. You can see it all over iOS. HTC had to create a workaround and no longer presents that menu option on the AT&T One X or Sprint EVO 4G LTE. "It appears HTC has made the changes they need to make," Nilay Patel, a former U.S. copyright attorney who now works for The Verge, and who has followed the case closely, explained to TechnoBuffalo. "So what's happening now is the exclusion order bars HTC from importing anything that violates the patents. Customs has to tell its guys at the ports what this means." It's the job of U.S. Customs to make sure that HTC's products don't infringe on Apple's technology, and customs has to do this at the border right when the phones come into the country. AT&T's One X and Sprint's EVO 4G LTE are the first phones from HTC that have had to enter the country since April 19th, so it's the first time HTC is dealing with this situation. "There's a little bit of naivety on HTC, they didn't know," Patel said. "I don't think they were expecting customs to enforce the order in this way. HTC should have probably stretched their [launch] dates, I think they got the first batch in and assumed everything was fine. That's all you can blame them for." "HTC is a little new to the game and this enforcement action at customs is happening without Apple and without HTC – they don't seem to be directly involved," Patel said. It typically takes about a month for specific instructions to be written up and passed to the dockworkers at customs. That's why it might have been possible for the initial allotment of HTC One X phones to get through. Patel said HTC is doing all that it can to avoid infringing on Apple's patents and to make sure the phones get to carriers and in consumer's hands. "They are doing, in some ways, a better job than Samsung," he said. "You can't blame them for anything other than they didn't expect customs to do this. Why would they expect customs to do this? They don't have visibility to customs the way you would expect them to." Customs has to inspect the new phones to make sure they don't infringe on the patent or HTC could potentially infringe on the patent again and the two companies could end up back in court. It would be a tireless loop of litigation, otherwise. You can't blame Apple, either. Patel said the legal battle, which Apple won, was over a legacy Apple patent that was used back as far as Mac OS 9. "They invented it then and they should protect it now," he explained. Unfortunately, nobody knows exactly what's going inside the doors at Customs, which is why we haven't seen updated shipment dates from AT&T or Sprint. "It's like the KGB," Patel explained. "It's not subject to the Freedom Of Information Act. The instructions are delivered electronically directly to the agents, there isn't any paperwork." When can we expect the phones to be back on store shelves? It could happen tomorrow or it could happen 6 months from now, nobody knows for sure. One thing is clear: Customs is putting a damper on carrier sales. The One X is AT&T's most powerful 4G LTE smartphone right now and the EVO 4G LTE is supposed to help usher in excitement for Sprint's 4G LTE network. If customers can't buy the phones they want, they'll likely gravitate to other devices, or maybe even choose other carriers with similar options. Sprint customers have already waited long enough for the next flagship EVO, what's to say they won't just give up on the carrier and jump to Verizon or T-Mobile instead? Sprint desperately needs its customers. Any roadblock preventing them from buying its best phone isn't going to help it hang on to subscribers. Worse, HTC needs to compete against Apple and Samsung for consumer mindshare, and U.S. smartphone market share, especially ahead of the Samsung Galaxy S III launch and Apple's incoming next-generation iPhone. The company's CEO has already said recovery of its U.S. market share will be "difficult." A judge has ordered Apple and HTC to meet in a courtroom on August 28th to attempt to settle multiple patent disputes. Hopefully, for the sake of AT&T, Sprint, HTC and consumers, the phones make it through U.S. Customs long before then.